Perfect for festival camping, lounging on the beach or for fun and games in the garden with the kids, this lightweight, easy to assemble pop up tent offers convenience without compromise. Setting up this tent couldn’t be more fuss free – perfect for when you require instant cover from the elements or for when you just can’t wait to get started with your camping adventure. 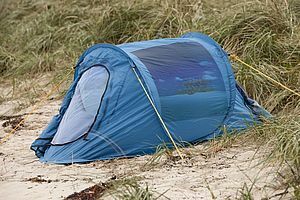 Simply throw the tent in the air, and voila, as if by magic, you’ll be stood in front of a fully functional two-man tent within seconds. It couldn’t be easier! The flexible fiberglass poles mean that packing your tent away is just as straight forward as pitching it. With a few twists and turns, your lightweight tent can be easily disassembled and stored within the easy to carry Oxford bag, ready for your next exciting camping trip. Waterproof up to 80 mm, you can rely on this practical pop up tent even if you can’t rely on the weather! And the best of it? The tents are decorated with an exotic private island motif, so even when the rain is falling, you’ll still be able to enjoy the feeling of blue skies and sandy beaches.